Chong Wishing’s film, set in the Kansai region of Japan between 1969-1971, is about Koreans Yong-gil and Young-soon -- played by Kim Sang-ho and Lee Jung-eun -- who run a tiny barbecue joint in an impoverished town near an airport. 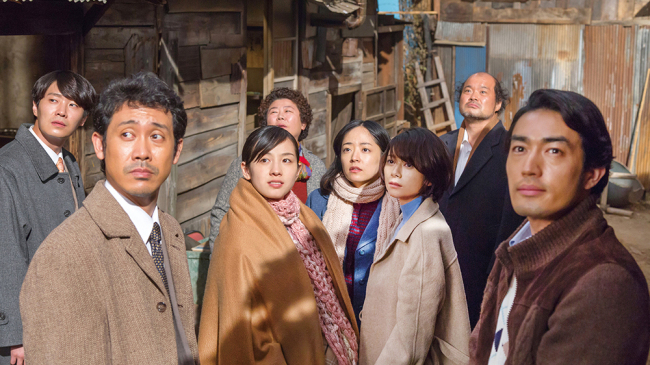 Their daughters Shizuka, Rika and Mika, and son Tokio-- played by Yoko Maki , Mao Inoue, Nanami Sakuraba and Ooe Shinpei, respectively -- struggle with poverty and prejudice against Korean-Japanese people. “We selected the film (as an opening film) because we believed its topic suggests a lot in today’s Korean cinema. It artfully talks about the sentiments that we are missing today, through a story that the creator himself knows very well,” said JIFF’s chief programmer Kim Young-jin, during a press conference and premiere for the film. Chong, 60, is only too aware of the struggles people of Korean descent face in Japan. In 2008, he wrote the play “Yakiniku Dragon” -- on which the film is based -- which was staged both in Korea and Japan. “I’m one of the people who were born and raised there (Japan). I was worried that the Korean audience would not follow this story as they don’t know much (about Korean-Japanese). But I felt like this is a story that, if not preserved in record, would be forgotten,” he said. Ethnic Koreans in Japan, called “zainichi” in Japanese, comprise mostly of people who immigrated to Japan in the early 20th century and their descendants. Earliest members of the zainichi community often fell victim to severe discrimination, which is depicted in the form of Tokio being cruelly bullied at school. Despite being homesick, financial difficulties prevent them from returning home. “Money on one hand, tears on the other. It’s the story of our lives,” says Rika’s fiance Tesuo about their situation. Yong-gil’s monologue about his life sums up their hardship, and the way he calmly says that he has “worked and worked” but cannot go home conveys the pain that they swallow. Rika’s outburst about their identity is another reminder of the people who seemingly do not belong anywhere. The movie touches on values that are universal, not just confined to the Korean-Japanese community, as it stresses the value of family. “It is a piece that deals with problems that also affects the general society in Korea and Japan, and how they are resolved and reconciled,” said Lee Choong-jik, the festival’s executive director. The film feels very much like a play, as most of the scenes take place in the restaurant Yakiniku Dragon. Chemistry among the actors is important in such a setting with minimal action and mostly dialogue, but it works superbly as the actors work well with each other in convincingly portraying a family. “I came across this film when I was thinking about the concept of family in this day and age. I came to learn more about the family through this picture,” said Lee Jung-eun. The film will bookend JIFF with Wes Anderson’s award-winning animation “Isle of Dogs,” which will close the festival on May 12. The 19th annual JIFF opened with an opening ceremony at Jeonju Dome at 7 p.m., Thursday. It will feature 246 films from 46 countries. Ten Korean feature films and 20 short films will compete in their respective categories. Guests that are set to attend the event include actors Ahn Sung-ki, Nam Gyu-ri, Kim Sang-kyung Ryu Hyun-kyeong and Ku Hye-sun, who directed a short film “Mystery Pink” that will be shown at the festival. Kim and Ryu are among the jury members of the Korean feature film competition and Korean short film competition sections. For more information on JIFF, visit http://eng.jiff.or.kr.